Adean Kingston, MD (Dallas) - Book Appointment Online! If there is NOT an appointment available ONLINE at the time you need, you can call the office to see if there is a cancellation and we may be able to accommodate you. To avoid wait time, please contact our office PRIOR to your appointment with your insurance information. All patients are required to present their photo ID as well insurance card upon check-in. Further, if you are unable to keep this appointment, you must give 24 hours notice by telephone- otherwise we will charge for the time reserved. Parking is available in the building's garage off Armstrong for 0-30 minutes for Free, 30 minutes-1 hour is $2.00, and 1 hour–All day is $5.00. 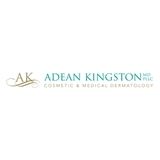 Dr. Adean Kingston, a Board Certified Dermatologist, welcomes patients age 12 and up for the diagnosis and treatment of skin cancer, cosmetic dermatology and general dermatologic care. She obtained her medical degree from the University of Pittsburgh School of Medicine, completed her Dermatology Residency at the University of Texas Southwestern Medical Center, placed in the 99th percentile on the Dermatology Medical Board Examinations, and helped start the very first Dermatology Department at the renowned Cooper Clinic. She has been performing cosmetic injections and procedures for over 15 years. Great first impression and on-point discussion.